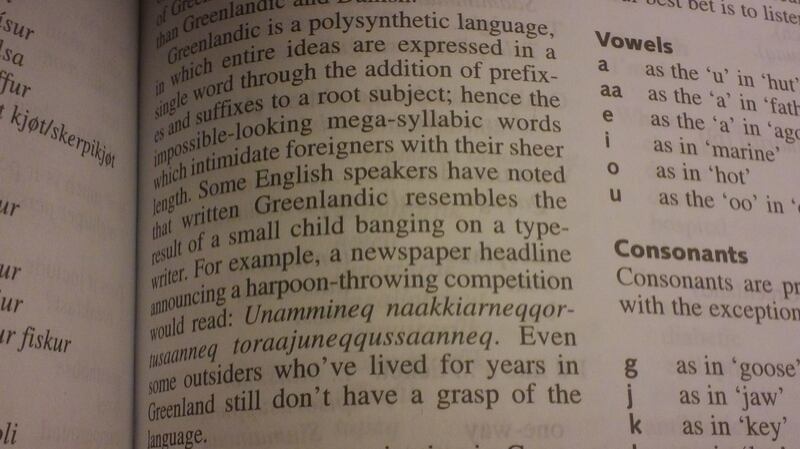 Before I begin, let me clarify by saying that yes, Greenlandic is a real language. Known also as “Kalaallisut” or “West Greenlandic”, it is an Inuit Language with Danish influence (and some English influence as well), spoken primarily in Greenland (obviously) but also by some in Denmark and, most assuredly, other places as well. For those of you to whom the term “polysynthetic language” doesn’t really mean anything, imagine something like Magnetic Poetry—in which you can assemble your own poems from magnet pieces of words. Now imagine that, instead of assembling sentences or verses with words, that you assemble words from word pieces. That’s a polysynthetic language for you. I didn’t know it at the time, but eventually that line about typewriters would become a running joke in my family, with some people calling Greenlandic “typewriter” or “the typewriter language”. Reading through the word list, I was entranced—it would be fair to say that it was love at first sight. Within seconds I was dreaming that a day would come in which I would have conversations in this most exquisite language, and hopefully be able to call myself fluent. Then I got the book out of the library and read almost all of it (especially the part on Greenland). Thereupon did I copy the Greenlandic glossary in the back and created Memrise’s first-ever Greenlandic course for English speakers (even before the Greenlandic category was established on that site, which it now is). Finding some Greenlandic media was easy enough because a lot of it is in one place: knr.gl. There is news, radio, sports, movie reviews, movie trailers (mostly in English with Greenlandic subtitles), video game reviews, and, of course, children’s programming. KNR, which itself stands for “Kalaallit Nunaata Radioa” (literally, “The Radio of the Land of the Greenlanders”), truly gives you a good glimpse of a culture that many spend their whole lives never thinking about. Greenland also has an extraordinarily noteworthy musical tradition which has, predictably, reached Denmark with often a lot more than modest success. Don’t expect to find a lot of these songs even in Danish translation, if you can even find the Greenlandic lyrics at all. I find Greenlandic music exciting, tense, modern, and extremely good at a wide range of expression techniques. I had been learning Greenlandic somewhat non-seriously on-and-off up until about a few months ago, when my M.A. Thesis was largely complete and I also was on semester break. Afterwards I began pursuing it with more seriousness, despite many people wondering why I could be devoted to something that was, for them, so strange. (1) Resources are scarce. This really goes without saying, and this is coming from someone who reads Danish fairly/very well, depending on his mood. If you don’t have Danish in your language arsenal, you are even more out of luck. But given as all numbers in Greenlandic that are higher than 12 are borrowed from Danish, not also to mention much Greenlandic technical jargon (some terms have both a Greenlandic neologism and a Danish equivalent), you’ll be tempted to dive into that world sooner rather than later, and you Greenlandic journey will be that much easier because of it. (2) The “q” sound is something I still struggle with regularly. Its sound, to me, sounds like “Ah-k-huh-r” when slowed down a lot. Almost everyone who learns this language struggles with it, although there are also problems with the “rl/ll” sound, which is probably like “d-l-German ‘ch’” which slowed down. The single “l” smacks of “dl” in English, but the d is very slight. Hopefully these approximations can ensure that you don’t struggle with these sounds as much as I did. If it makes you feel any better, there are only three real vowel sounds in Greenlandic: a, u, and i. The letters “o” and “e” are shifted formed of “u” and “i” that come about in the fusion of polysynthetic word components. (4) A directory of common suffixes does not yet exist for free—and I think every student of the language would require it. There are dictionaries to be found, without question, but with over 20,000 words in the most comprehensive ones, and almost no resources devoted to the “most common words” (or pieces), you may be out of luck in finding a quick way to find a list of words that will prove most useful to you. The Kauderwelsch Guide, mentioned above, is definitely as good as it gets. 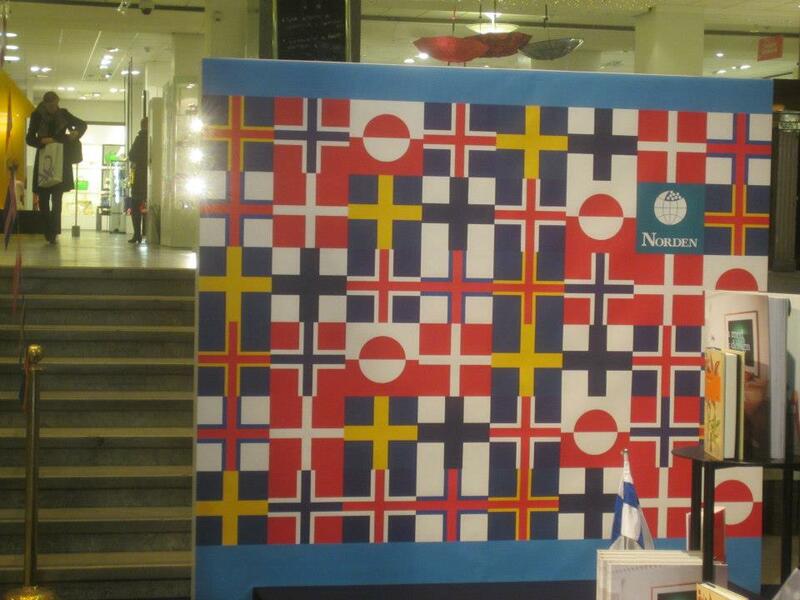 The plus side is that there are cultural institutions in Greenland and in Denmark that would be more than willing to help you on your journey and answer, with a few internet searches, most of your questions about Greenlandic and Greenland. It will be interesting for me to reflect on this piece as I continue on the journey (or give it up, which doesn’t seem likely at this point), but as for now, I am looking forward to the day in which all of Greenland’s musical glory and intriguing culture is a lot less of a mystery. That’s what a librarian at the Great Synagogue in Stockholm told me when I was doing research and told her that I was learning the language. The irony of this statement is that I was, at that same moment, surrounded by books that were written in Swedish and Danish magazines that were obviously not going to translate themselves. I’ve gotten a good deal of encouragement by my desire to study the Nordic Languages in detail (Nordic comes to include Finnish, whereas Scandinavian does not). Interestingly, I entered the “high gear” for this study while living in Germany (and after having been to Stockholm not once but twice! ), and not while living in Scandinavia. Alongside some encouragement, I’ve also met some puzzled people who wonder why I don’t study something more “useful” like French or Chinese. “They All Speak English” is NOT true! I, like many people, came to Stockholm during the first week expecting everyone to be fluent in English. To be fair, there were many people who spoke with extraordinary skill to the degree that I would have guessed they were Midwestern American rather than Swedish. But now comes the bubble bursting: Yes, English is widely spoken, but not by all. Some people are surprised when I tell them the fact that I encountered not one but TWO people who didn’t speak English in Stockholm (but who did speak Swedish)—and that was only during my first week! Both of them did not appear to be ethnically Swedish, but it should be known that if you are expecting everyone in Scandinavia to be fluent in English (or even to have some knowledge of it), expect to be disappointed. I remember going to a big supermarket in a far-flung corner of the city. I remember asking something about asking a staff member where carrots could be found. He didn’t speak a word of English, despite numerous hand-gestures. Only across the street from where I studied there was a newspaper store, with ice cream and other treats, and the owner didn’t speak any English at all, responding to me in Swedish which I did not yet understand. Many people do not understand how, thanks to the Norse Invaders, the surrounding languages were accordingly impacted. Knowing a Scandinavian Language will help you with English, German, and the West Germanic Language family as a whole, and even more so with the other two members of the Scandinavian trifecta. You may also learn how to speak English with a Scandinavian accent, which is something that many people actually really like (and you are likely to sound smart while using it). Reference points for remembering words in the other languages come more easily. If you speak English as your first language, the Scandinavian Languages will help demystify German and make it seem more “normal”. If you learn Danish, expect to learn secrets of English pronunciation that may get you mistaken for a native. And once you have one of the three, the other two may come to you with little effort. If you want to learn any of the Sami Languages, it is necessary that you know Norwegian, Finnish, or Swedish—or preferably all three. If you want to find English-language resources for Sami Languages, you’re out of luck, although no doubt you will find something. If you want to learn Greenlandic, know that every number higher than twelve is expressed exactly as it is in Danish, not also to mention many Danish import words in the language—more than English import words. For learning both of these, English itself will not suffice, and neither will German. The technology and the databases are in other languages, the ones of which I’ve been talking about this whole time. Never will I forget a student project in Copenhagen (featured in the Economist, I believe) in which there were non-Danish speakers who had such trouble pronouncing the main street names that they affixed machines nearby that would read the names out loud to them. That was when I was entering my honeymoon phase with the Danish Language, and I figured, “my, wouldn’t that be useful?” Now, I know that I need no such thing. Yes, Danish pronunciation takes a while to get used to, but it is nowhere near the level of confusion that English pronunciation endows upon the average learner. If you learn the languages, then you will remember street and place names more easily, and even if you ask for directions in English, if you can’t pronounce the names, you are most definitely out of luck. An extraordinary Confidence Builder for an English Speaker learning his/her first foreign language! If you think that the Romance Languages will come easy to you—well, the Scandinavian trifecta offers simpler grammar and more English cognates than can be found in Spanish. The only real drawback can be the fact that the pronunciation and the rhythms can take some time to get used to (and this is true with Swedish, Norwegian, and Danish alike). Swedish in particular has a perplexing “sj” sound that may require some adjustment time, and the Danish “stød” is purported to be the stuff of nightmares. Rest assured that you will unlock the mysteries of both with enough willpower, confidence and commitment, should you so desire. Use complicated sentence structure, spice it up with some colloquialisms, and, of course, speak confidently and firmly. Sometimes you may need to make it clear that you have progressed beyond phrasebook material, but most of the time just speaking with fortitude will work. Even in the worst case situations, you will definitely find friends who will be willing to help you and speak the languages you want. If you are interested in any of the three (or all of them), there are so many ways to get started! Endless television programs for kids have been dubbed into the Scandinavian Languages (don’t believe anyone who tells you otherwise! ), and you can prepare for media exposure very quickly after a handful of exercises, worksheets, or textbook chapters. 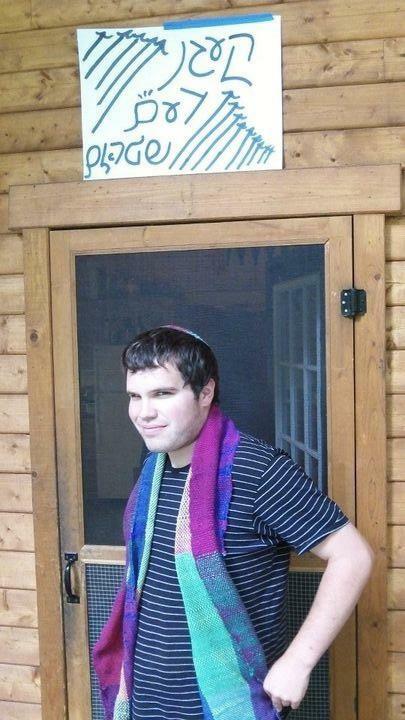 For the past year and a half, I have had to live with two versions of myself: the one who was unmistakably American, and the one who most Americans (and many others besides) thought was a foreigner (and who were surprised to find out that I was born in the U.S and lived there for twenty years). Being a native English speaker certainly has its advantages—the fact that, just by virtue of me writing in this language, more people are likely to read what I have to say (even in the world of Google Translate). It has enabled others to treat me with respect and to turn to me whenever they need editing, help, or even a slight suggestion for what word to use. Because of this prominent idea that Americans are monoglots, I sometimes feel self-conscious when making any single mistake. Lapsed into Danish during the Swedish conversation hour? And then there are the pangs of insufficiency whenever I tried to speak in the local language and get answered in English. A few months after my most recent vacation (Naples, in February 2014), I noticed that there is a simple way around this: using complicated sentence structure and sentences that are clearly not phrasebook material. But before I realized that, getting answered in English, wherever it was (outside of Anglophone countries, that is), made my heart sink. “Why did I have the terrible misfortune of being born into a nation imagined for being naïve, stupid and unworldly?”, I figured. Especially when speaking languages associated with people who speak very good English (my next post will be on the value of learning the Scandinavian Languages! ), I realized that I had to cleverly disguise my accent somehow. I asked my friends from some other countries (especially Spain and Italy) what they do for accent reduction. The answer I most commonly hear: I don’t do anything. Why? “Because people like my accent”, I hear. And there are so many times I have heard that American-accented anything sounds awful. But interestingly, there is an advantage to having the accent: for one, American English does have a wealth of phonetic sounds in ways that many other languages do not. The various influences of American English enable me to see how many languages contributed to its development. Last, but not least, the surprise factor from people when I hear “that’s very unusual for an American to be able to speak like that” is always enough to make me smile. Just like any identity allotted in life, my American accent sometimes hurts, and sometimes it can be a source of comfort. And one thing I’ve learned about staying in Germany especially is the fact that Americans are very much not the only people who go abroad and never bother to learn the local language to any degree. People of all nationalities tend to do this. It is high time that we also stop trying to pretend that Americans can’t learn about the world, much less its many languages, when all such an endeavor takes is wise use of time, commitment, and media exposure. I look forward to the day when my case of American polyglottery becomes the rule rather than the exception.